New Frappuccinos are always the bane of every Barista's existence! I can tell you from first-hand experience it's a process to make, takes longer than most of the other drinks and everyone wants one. Check out this latest creation! Just like most specialty drinks this one will be here and gone before you know it. To get the most out of the marketing they are only allowing this drink for a limited time. The rumors are around 4 days but who knows. I also know that every teen, tween, and person with an Instagram account and affinity for sugary beverages will be purchasing this so supplies are limited. Though Starbucks hasn't released any official info on its latest concoction, baristas are already sharing their trial runs on Instagram. One photo shows off the treat's variety of sugared-toppings colors, with green, red, and blue edible crystals adorning whipped cream. 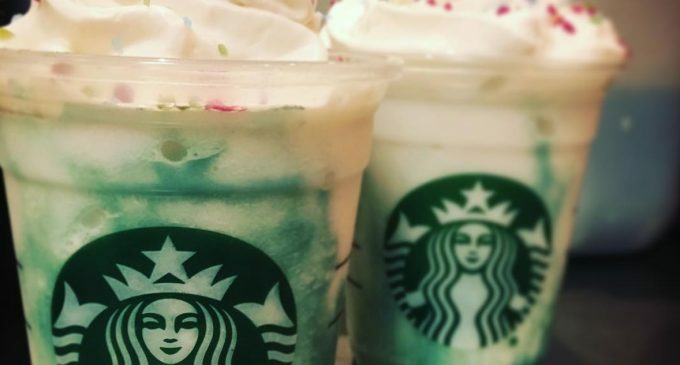 Another photo highlights the turquoise swirls the Frappuccino is rumored to feature. The reportedly peach-flavored drink will be available for purchase on Thursday, March 22, but be warned: It will remain on the menu for only four days (or until supplies are depleted), according to Business Insider. Will you be waiting in line for this next beverage? We will, and we'll let you know what we think!